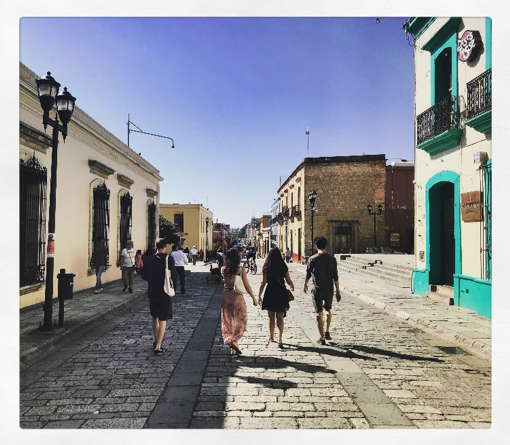 Season + Taste embarked on one of their most exciting restaurant research and staff development trips to date sending a team of six to Mexico. Here they fell in love with all things MASA + MEZCAL, so much so, it will be the name given to a new Mexican Cantina (bar and restaurant) opening on Stokes Croft, Bristol. 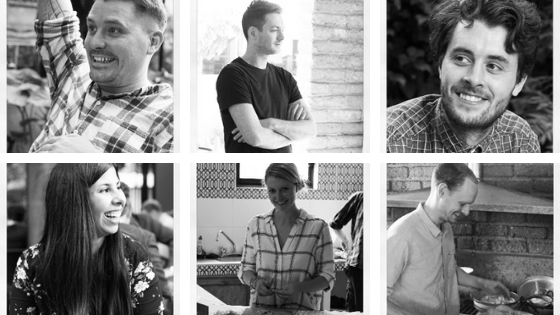 Season + Taste directors Kieran and Imogen Waite, accompanied by project manager Sara Sanna, Executive Head Chef Mark Chapman, Cargo Cantina Head Chef Alec Morton and Manager Marcus Maries went on a Mexican-mission to achieve two things. Firstly, to eat the tastiest tacos that they could get their hands on and to gain new inspiration for existing taco bar Cargo Cantina at Wapping Wharf. And secondly, to learn as much as they possibly could about all things relating to staples of Mexican food and drink, masa and mezcal, and to bring back to Bristol a knowledge and passion to be injected into a new opening in 2019! Here are some of the highlights form their culinary adventure…. Like bakers in the UK, tortilla makers in Mexico start early, so Alec, Imogen and Mark got up at 6am on both tortilla training days to get stuck in with the chefs at Maizajo! Santiago ,the owner of Maizajo, made the course very personal and thorough. He taught them the six stages of making tortillas, which includes the importance of sourcing corn from sustainable farmers who focus on non-GMO heirloom varieties. This helps to provide a culture for biodiversity and preservation of corn. Another is Nixtamalization the process of preparing ‘maize’ where the corn is soaked and cooked to a certain texture in an alkaline solution (usually limewater) steeped overnight and then washed, which improves colour, flavour, elasticity and digestion. Now called ‘Nixtamal’, it is then hulled or made into a dough to make tortillas or tamales. Nixtamalization will be an important process for the chefs when making our own tortillas at Masa + Mezcal and it will be a skill the chefs will find very interesting and fun. 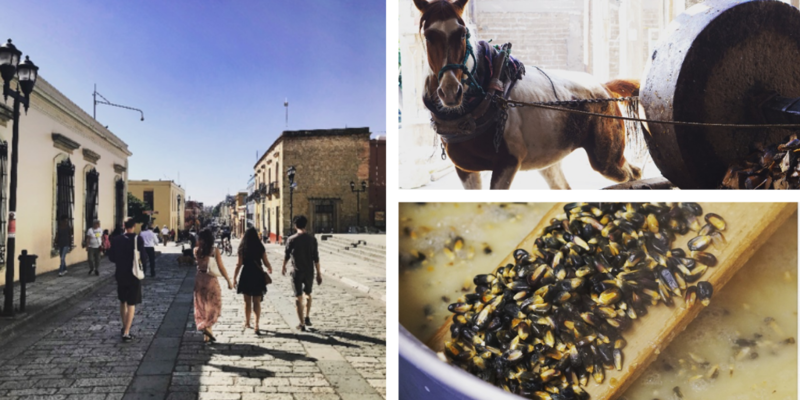 After a few days in Mexico City there was a real danger of the team eating all of the tacos in town, and a need for them to broaden their horizons, so with their ‘masa mission’ complete the team headed to Oaxaca – the land of Mezcal! First stop, Palenque “Gracias a Dios” which was one of the best experiences they could ask for. It is located in the little town of Santiago Matatlán, about an hour away from Oaxaca, and is famous for mezcal production. The long, windy country road to get there is called “Camino de Mezcal” literally meaning the “road of mezcal” and you can see hundreds of agave fields on the way and agave plants growing wild on the side of the streets. 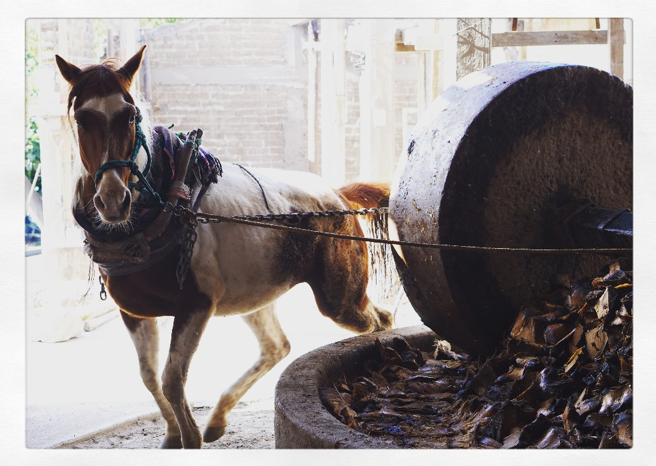 Here is Sara’s experience with the ‘Maestro Mezcalero’, who is the main man in the palenque, (artisanal mezcal distillery). Along with his whole family they take care of every part of the mezcal production, from growing, roasting, fermenting, distilling and bottling. A they drink a little too! ‘Their hospitality was simply amazing, once we arrived we cooked a home-made meal with Doña Maria, the grandmother, who taught us how to make mole (sadly without revealing her secret ingredient!) and we had lunch all together. Afterwards we visited the palenque where they explained to us the whole process of mezcal making, from field to bottle. “Can we come to help tomorrow?” we asked “Yes sure 6am we’ll see you here!”. I am pretty sure they thought we were joking as their faces were quite surprised when they saw me and Marcus the morning after, ready to learn all the secrets of mezcal making. 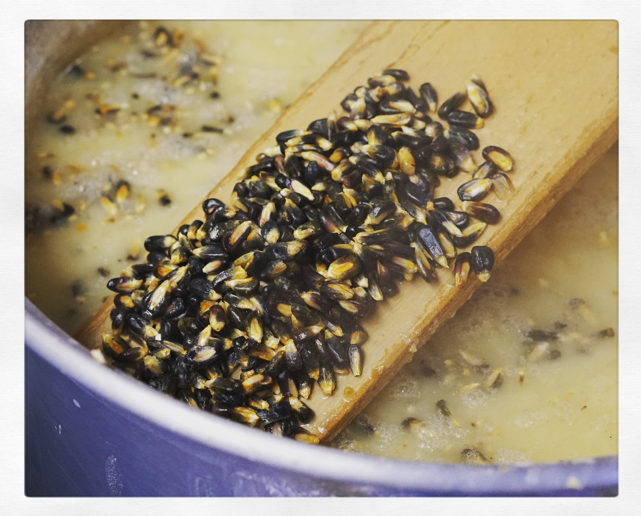 We helped to prepare the cooked agave for the mash – this involved cutting them with a massive machete into small pieces, and is one of the hardest jobs I’ve ever done. Imagine that they do that for the whole day, every day. We also helped with the distillation, which is still done in a very rustic way and again involves a lot of physical work. It was a real experience, we actually saw and tried ourselves how much passion and hard work goes into making the Mezcal that we can only love it even more! Not every day in the Mexico trip meant everyone was up working from 6am however. Some much-needed taste testing had to be done in plenty of restaurant stops. Pujol has to be the best restaurants in Mexico for taco tasting- ranked the 13th best restaurant in the world, according to the much converted San Pellegrino World’s 50 Best Restaurants. Executive Chef Mark felt honoured to have the opportunity to visit. From the experience of eating an entire tasting menu without a knife or fork in such an acclaimed restaurant, to discovering his new favourite herb, Hoja Santa, which is a green leaf with an aniseed like flavour. We couldn’t get Mark to stop talking about Pujol. Ask him about his favourite dish and he’ll list off six. From the crispy puffed yellow corn with white bean puree to scallop ceviche taco with burnt avocado, we can’t blame him! Pujol were even bold enough to serve just a ‘mole’ – pronounced mo-ley as a standalone course. Normally a sauce found all over Mexico used to add a bit of excitement to any dish. Pujol’s ‘Mole Madre’ is a new take, from a live started meaning the one that the team tried was 1365 days old. 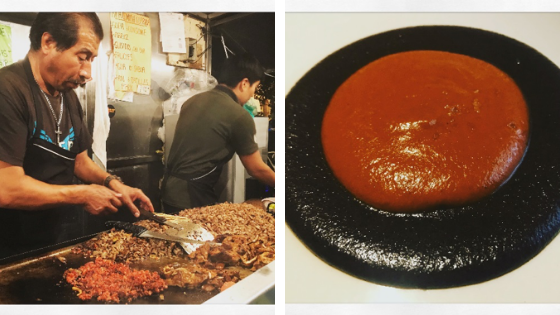 It was brave, innovative cooking at its best and has inspired Mark and his team to develop their own mole recipe for Masa + Mezcal – mezcal mole anyone? He’s also planted his own Hoja Santa seeds to grow so you may get to try this too! There is of course so many more places the team visited for training, tasting and tequila appreciating but this you will just have to see for yourself through the stories that Masa + Mezcal will portray and by talking to the staff at Cargo Cantina. These trips are invaluable for the creation of new dishes, staff knowledge and appreciation, but most importantly bringing a passion and a version of a Mexican Cantina to the quirky and cultural streets of Stokes Croft. 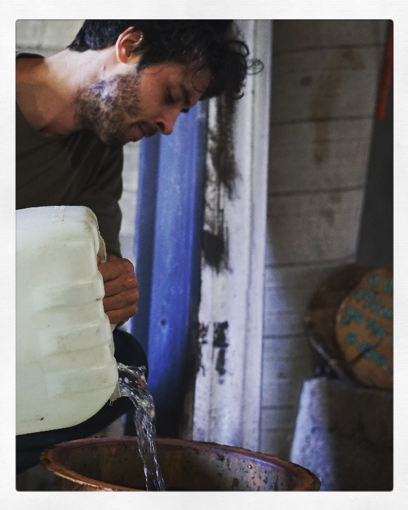 Keep up to date with the creation of Masa + Mezcal on Instagram, @masa_and_mezcal and we look forward to sharing our discoveries with you in Spring!